Holy moly it's another cold one out there, -33 without the windchill. We've had a bunch of snow in the last few days as well. I, for one, will be super glad when spring comes around, and the snow/ice melts away for good, and the plants start blooming. Cabin fever is also starting to set in and I'm tired of wearing socks and sweaters. Hopefully sooner than later...........right? Well in honor of spring........that is right around the corner.......at least I hope. This cute hedgehog image is from Stampavie's Tina Wenke collection. I colored the image with my copics, and then added Diamond Glaze to the raindrops to add a little more dimension. 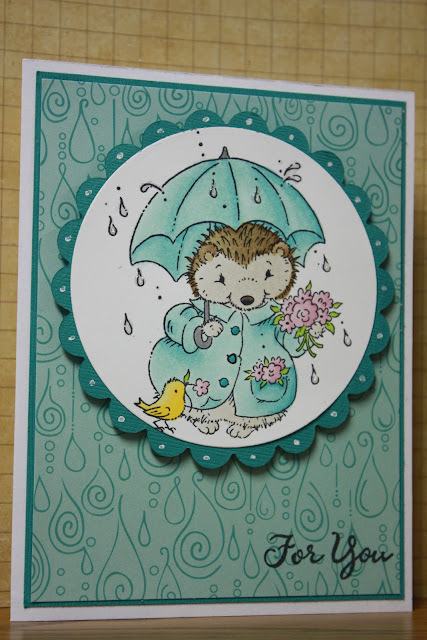 The raindrop looking pattern paper is April Shower's from Bella BLVD's Swing into Spring collection. Also, I added some doodling dots around the scalloped circle and put all the layers together.